LOCATION: Harwood Bandstand, 1755 Beach Avenue @ Bidwell Street, Vancouver. 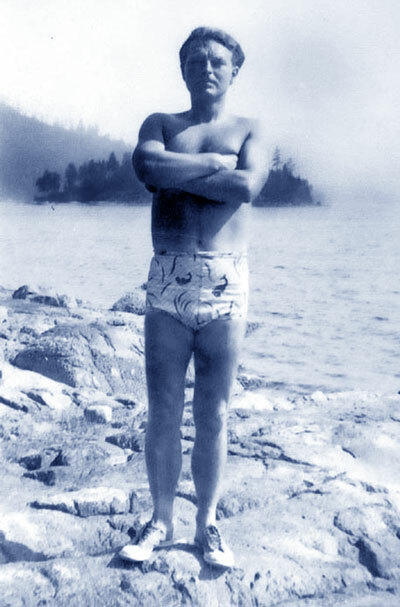 Malcolm Lowry was an alcoholic novelist whose relationship to Vancouver – and much else – was uncertain, though there is no doubt that he did his best work here. In Under the Volcano, arguably the most famous novel ever written in British Columbia, he offhandedly refers to Vancouver as a place “where they eat sausage meals from which you expect the Union Jack to appear at any minute.” During his fourteen years in the Lower Mainland, mainly in North Vancouver, Malcolm Lowry briefly resided at three West End locations giving rise to his poem, Lament in the Pacific Northwest, about the Harwood Bandstand, which was built in 1914 and restored in 1988. But still the old bandstand stands where no band stands. Lowry first took occupancy of his beloved “little lonely hermitage” without plumbing or electricity in 1940 following his marriage to Margerie Bonner. In June of 1944 his shack burned, destroying some of the manuscript. Lowry rebuilt the shack. According to Bonner, the fourth and final draft of Under the Volcano was completed at Dollarton on Christmas Eve, 1944. 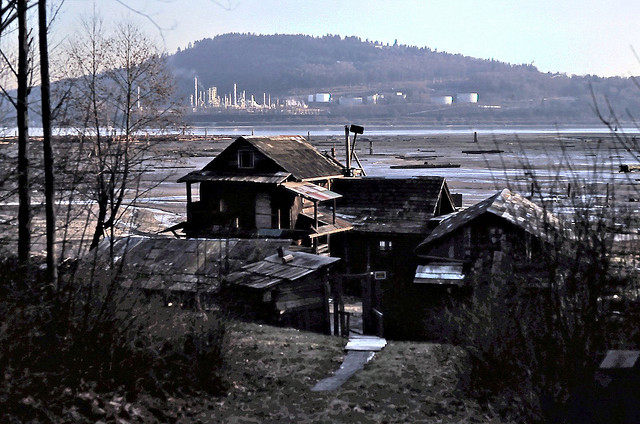 He habitually despised Vancouver, referring to it in his fictions as Enochvilleport, meaning “city of the son of Cain.” Conversely, he referred to the tiny gathering of squatter’s shacks on the foreshore of Burrard Inlet as Eridanus, a name drawn from the river in Virgil’s Aeneid that waters the Elysian Fields of the Earthly Paradise. Writing about Lowry is an industry unto itself. His literary archives are kept at UBC. Sherrill Grace of Vancouver has become one of the world’s foremost authorities on his life and works. 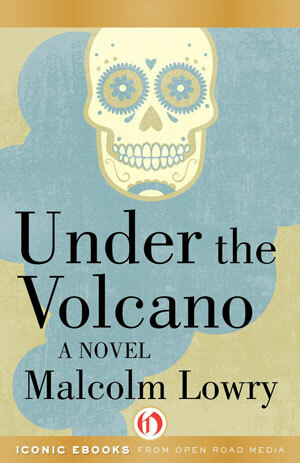 The most famous book ever written (mainly) in British Columbia is Under the Volcano by Malcolm Lowry, ranked eleventh by the editors of Modern Library in their list of the best 100 novels of the 20th century in English. Set in Mexico on the Day of the Dead, but including a favourable reference to British Columbia as a ‘genteel Siberia’, Under the Volcano was continuously revised during many of Lowry’s 14 years of intermittent residence in Vancouver and North Vancouver, primarily at two squatter’s shacks at Dollarton. A sign saying Malcolm Lowry Walk, located at the beginning of waterfront trail at the eastern end of Cates Park in North Vancouver, now provides some modest recognition for his infamously alcoholic, self-tortured literary life. A plaque has also been added. 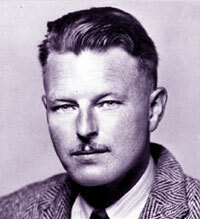 Clarence Malcolm Lowry, Vancouver’s most internationally venerated and critically studied writer, was born on July 28, 1909 in Birkenhead, Cheshire, England. His father was Arthur Lowry, a wealthy and strong-willed cotton broker who owned plantations in Egypt, Peru, and Texas. His grandfather from his mother’s side was a Norwegian sea captain. Although Lowry became an athlete and graduated from Cambridge University in 1933, he felt guilty about his inability to conform to his family’s upper-middle-class, Methodist background and he was haunted by near-blindness that had afflicted him for four years. At 17, he left his hometown of Liverpool for a four-month trip to China as a cabin boy on a freighter. His wanderlust, sexual insecurity and alcoholism led to permanent estrangement from his father and England. Lowry initiated a student-mentor relationship with the American writer Conrad Aiken in Massachusetts; he then sailed to Oslo in 1930 to compliment Norwegian Nordahl Grieg on his novel, The Ship Sails On. In 1933 Lowry published a derivative, seafaring novel, Ultramarine, which he came to regard as ‘an inexcusable mess’. Initially inspired by readings of Eugene O’Neill’s early plays, Ultramarine is a self-conscious search for identity. Its protagonist asks rhetorically, “Could you still believe in… the notion that my voyage is something Columbian and magnificent?” Lowry later conceived a lifelong cycle of novels to be called The Voyage that Never Ends. Lowry’s third novel, October Ferry to Gabriola, was edited by Margerie Bonner Lowry from 3,000 pages of notes and published in 1970. Although generally considered to be a dismal failure, it includes some memorable references to the West Coast locale. A poem of lament describes the English Bay Band Shell in Vancouver as eternally empty, alone and locked. Its concluding line, “but still the old bandstand stands where no band stands,” is also the title of a chapter that bemoans the scrupulous joylessness of a young city eager to harass harmless drunks, annihilate old buildings and tame the beauty of Canada’s wilderness. Living above an abortionist’s clinic, the central character observes, “It was a well-known fact the inhabitants of the West End were so pure that they preferred to think they had not natural functions at all.” The former head of the UBC Library School, Basil Stuart-Stubbs, has prepared a complete list of addresses where Lowry lived in Vancouver througout his 14-year tenure, including the West End. This list is stored at UBC Special Collections, the world’s main repository for Lowry archives. Lowry’s life and work have been the subject for innumerable books and academic studies. In 1984, Vancouver screenwriter Michael Mercer’s play about Lowry and Conrad Aiken, Goodnight Disgrace, premiered to critical acclaim in Nanaimo. In the same year Vancouver poet Sharon Thesen published Confabulations, Poems for Malcolm Lowry. A film version of Under the Volcano, starring Albert Finney and Jacqueline Bissett, appeared in 1985, directed by John Huston, with a screenplay by Guy Gallo. 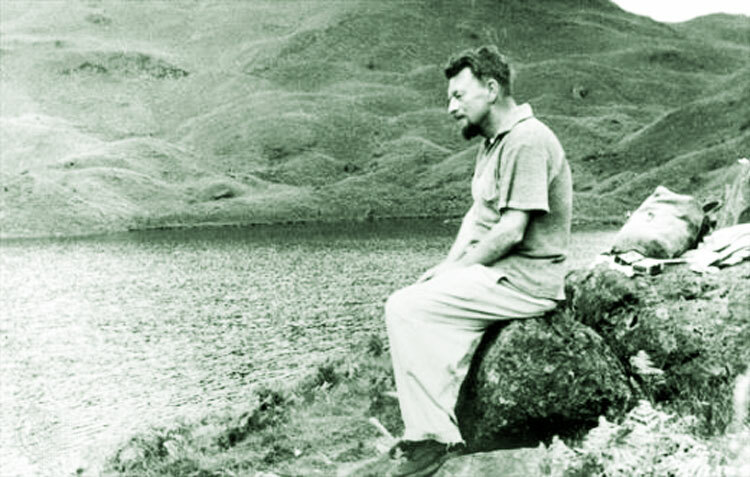 An superb, interpretive documentary portrait of Malcolm Lowry by Donald Britain, Under the Volcano, is available from the National Film Board. And died playing the ukulele. BEFORE T .E. LAWRENCE (LAWRENCE of Arabia) burned his personal library, he saved the books he liked. One of the volumes spared was an obscure seafaring novel called Ultramarine. The author of Ultramarine, Malcolm Lowry, loathed his first novel and tried to suppress its circulation for the rest of his life. He alleged that he was forced to re-write the entire work in a matter of weeks because the publishing house had lost his manuscript. Accused with plagiarism after Ultramarine was published, Lowry never allowed any academics or booksellers to have access to his personal copy, an extensively annotated edition he kept hidden, hoping to one day rewrite Ultramarine–and redeem himself. But of course there was no redemption for Malcolm Lowry. The author of the most famous book ever written in British Columbia, Under the Volcano, was a paranoiac alcoholic who died ignominiously, guilt-ridden and obsessive to the end. Now UBC Special Collections has purchased Lowry’s personal copy of Ultramarine from its owner, a California woman who had befriended Lowry’s equally impossible alcoholic wife prior to her death. As soon as UBC’s Brenda Peterson learned of Ultramarine’s impending auction, she and scholar Sherrill E. Grace jumped into action. Because the library’s acquisitions have been drastically reduced, due to inflation and the low Canadian dollar, two UBC vice-presidents–both scientists–helped to finance UBC’s successful bid ($14,000 U.S.). The acquisition enhances the value of UBC’s already unprecedented stash of Lowry loot–including photos taken by Basil Stuart-Stubbs, for a lark, of every location around Vancouver where Lowry lived. Scholars from around the world will beat a path to UBC, eager for new glimpses into Lowry’s tortured soul and brilliant mind.